George Walton set up as a designer and decorator in 1888, leaving the role of clerk. His first commission was the decoration taking place in a smoking room at 114 Argyle Street, that Miss Cranston had originally opened as a tea room in 1884. 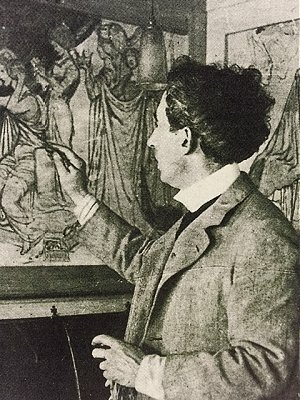 By 1896, Walton had earned his name in the field of stenciled wallpapers, which in turn made him the ideal candidate for furnishing Miss Cranston’s new tea rooms in Buchanan Street. During the shops renovation periods, he designed elaborate decorative distractions; but the interiors, particularly the Billiard Room had a cohesive theme of country-style fittings. Matching tables and chairs, illuminating fittings over-hanging the billiard table, and extravagant colourful tapestry-like pieces mounting the walls. The young competitor and collaborator Mackintosh worked alongside Walton in these same tea rooms in 1897, where the roles were reversed or rather, more exclusively to one another. Walton focused on the flat surface designs, whilst Mackintosh on furniture and practical products. By this time, Mackintosh was leading the way in furniture design, and Walton went forth on a journey to London in 1898. Much of his inspiration was owed to Morris & Co, and Voysey, his designs deriving from England rather than his Scottish roots. His independent shop opened in Stonegate, York, in 1898, the same year that he furnished the Elm Bank in The Mount. Another set of tea room interiors he had embarked on was for Rowntree& Sons in Scarborough over 1896-7. The turn of the century saw Walton flourish as a commercial designer where was producing work for Liberty & Co, and J.S Henry. London had in fact treated him so well that his success allowed for the design and production of his very own first house to be built, The Leys at Elstree. It was ambitious, and symmetrical, but indeed the first of many architectural commissions to come, some of which include WernFawr at Harlech (1907) and the White House at Shiplake (1908). Walton had formed the principle through designing whereby ‘the interiors were tastefully and resourcefully designed to combine conventional ideas of quality with Walton’s own style’, defining precisely why he had become so popular. Researched and written by Tony Geering & Kristy Campbell.